Peony, Latin name Paeonia, is an herbaceous perennial valued for its bright, ornamental flowers, attractive foliage and pleasing aroma. The plant typically reaches 2 to 4 feet in height with a spread of 3 to 4 feet. Peony plants bloom during late spring and early summer, producing flowers in a range of colors, depending on the variety. The plant tolerates drought-like conditions, especially once established, and sometimes survives with little or no care. Native to North America, peonies thrive in USDA hardiness zones 3 through 7. Peony requires a planting site that consists of well-drained, loamy soil to avoid fungal diseases and root rot. Amend heavy or slow-draining soil with compost, ground pine bark or aged manure to increase the drainage and fertility. Use a garden tiller to work a 2-inch layer of the chosen amendment into the soil prior to planting. A soil pH level of 6.5 to 7.0 further ensures optimal growth. Perform a soil test, available from your local county extension office or home and garden store, to determine the pH at your planting site. Add dolomitic lime following the manufacturer's instructions to increase the pH if necessary. Peony adjusts well to fall planting, so it can establish itself before the following summer. Planting in spring will work, but plants may not flower as profusely the first season. Peony plant thrives in a location that receives about six hours of full sunlight throughout the day. Partial afternoon shade protects the flowers from fading in hot climates. For the best results, space plants 3 to 4 feet apart. If planting from bulbs, place each one in the ground so the “eyes,” or small red-colored buds, sit 2 to 3 inches below the soil's surface. Peonies perform best with a deep, thorough watering once every 10 to 14 days. Thoroughly soaking the soil at each application encourages a deep, extensive root system, which also increases drought tolerance later in the plant's life. Reduce the frequency of watering to only during periods of drought after the first year of growth to minimize the risk of root rot. A low-nitrogen fertilizer such as 5-10-5 or 5-10-10 NPK encourages development of the flower and root system while preventing the plant from becoming lanky. Applying the fertilizer during early spring, when stems are only 2 to 3 inches in height, helps the plant survive the oncoming summer heat. Never allow fertilizer to touch the plant's stems, and always follow the manufacturer's instructions for proper dosage and application. Deadheading improves the aesthetic appeal of the peony and helps the plant conserve nutrients for flowering the following year. Deadheading is the process of removing faded and dead flowers from a plant. Pinch off the blossoms close to the stem once they begin to fade. All extra nutrients formerly reserved for forming seeds will be redirected towards producing more blossoms. Peony plants require a heavy pruning in fall after the first frost of the year to control disease and protect the roots from cold damage during winter. Cutting back the stems to ground level will allow for new growth the following year. 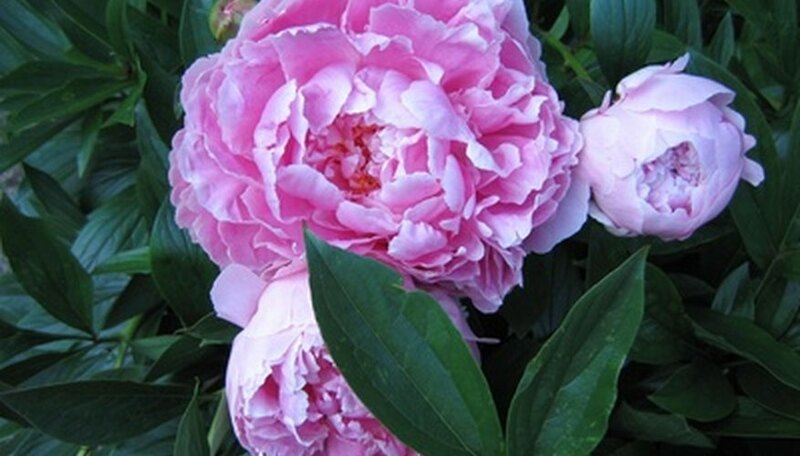 Only prune herbaceous peonies, as tree peonies won't grow back. Plants require no supplemental mulching and return year after year in hardiness zones 3 through 7.